Stand 2 - Site of the Children's Playground on The Greencroft. 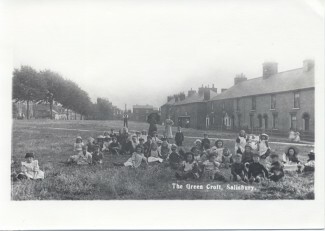 Children on the Greencroft at the start of the twentieth century. Copyright and with kind permission Peter Daniels. 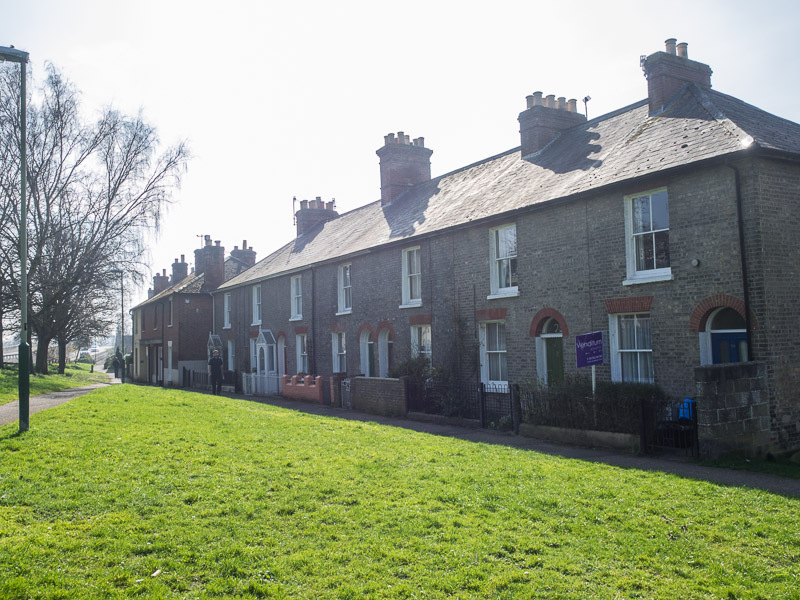 Salisbury has always regarded The Greencroft as an essential recreation area. This was particularly important for the children and there is still a playground here now. 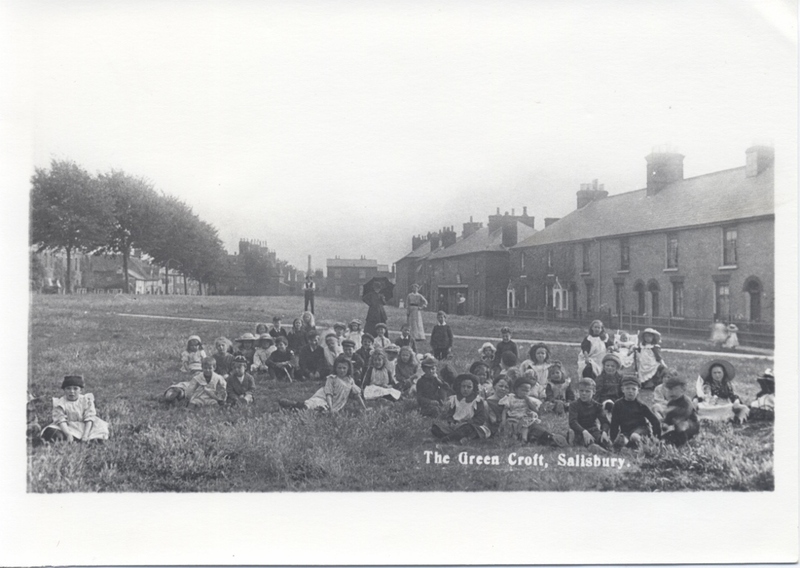 The old attractive photograph on the right is of a crowd of children on the Greencroft in 1901 or 1902, taken in the same location as the photograph above, as it is today. It was originally published as a Salisbury postcard. Bonfire night on the Greencroft was the highlight of the year for many local children, particularly in the 1950s. Rival gangs of children from Greencroft Street and Culver Street competed with each other to build the biggest bonfire. ‘It was really funny because Culver Street where this demolition had been done, they used to have their bonfire on there. Well they’d come up and try and steal things from our bonfire and we did the same thing, it was hilarious but they still had their bonfire and if theirs burnt out quicker than ours they come up onto the Greencroft’. In addition there may have been up to 30 individual bonfires alight at once, with families all setting off their own fireworks. ‘And then one year we had this enormous bonfire and… it was about a week before bonfire night and someone came racing in our back garden along the alley way and saying ‘The bonfire’s on fire’ and all the children…we went rushing up the street and there was masses of flames in the Greencroft and then we heard, these bells and the fire engine rushing up Salt Lane and round the corner and up Bourne Hill onto the grass and there were these firemen there with this big hose pipe and they were just sort of watering it all down around the bonfire and we thought ‘it’s our bonfire!’ and of course when you think about it there were tyres on this bonfire, there were sort of tar barrels and things like that and this black acrid smoke, I can remember it now and the smell was unbelievable’. ‘And it got very, very big and after a while we went to the council…’cause we kept getting told off for burning the grass, ‘Could you build a concrete square?’ and that concrete square that’s in the middle of the Greencroft now is where we used to build a bonfire and that’s what it was put there for, for the bonfire. And that shows you the sort of size that it was. ‘Cause we used to cover that and right the way up, once or twice we got told to make it a bit smaller because they felt it was a bit too big but we used to build that and even guard it. I’ve spent many a night up there in the bonfire on guard’. 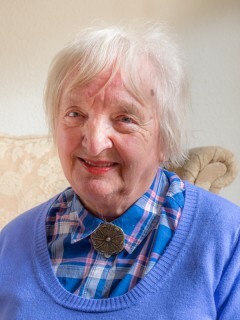 Jan Truckle remembers playing in the WW2 Shelters and Bonfires on the Greencroft. Listen to her audio clip at the right of the page or on your downloaded MP3 file from the Downloads page. Before we leave the children, look at the background of the photograph. The nearby row of houses is still there, but the Ring Road has eliminated those on the far left corner of the Greencroft. These were the ‘Eyre’s Alms Houses’ named after their founder. They stood on the London Road, just before it swung down into the City. Notice again how the Ring Road sliced off part of the Greencroft. Now leave the Greencroft and go down back to our starting place at the letterbox. From there, turn left and walk along Greencroft Street. I was a child of the 50`s and early 60`s, I lived at 60 Paynes Hill(still there today but totally different) In the very early days we had the Culver St. bonfire but eventually when I got a bit older we would go the Greencroft bonfire. I well remember the year the the bonfire was set alight before Nov 5th we were gutted, but we did manage to rebuild it but not as large as previously. We used to have a week off school just before bonfire night, my friends and I would go to town in our “trolley`s” and spend all week collecting burnables for our bonfire, which included car and bicycle tyres; just anything we could carry that would burn. When we built the “bommy” to a decent size we would climb it and make dens inside, i remember me and a friend being on top of the bonfire having a tyre fight with other kids. When the big day came to light the bonfire it was very exciting, if you arrived at the Greencroft late it was SCARY trying get close to the bonfire; there was people everywhere fireworks including rockets, catherine wheels and bangers going off sometimes overhead or around your feet. If you met somebody you knew you would often have a banger thrown at you or vice versa. It was a H&S nightmare but very few people got injured. You could tell by the sound of the banger when it was about to explode, so you knew when to throw it.